The Springfield Housing Authority has been selected as one of 27 cities and one tribal nation in the country to participate in a pilot program to provide free or low-cost broadband Internet access to low-income families. President Barack Obama was to announce the ConnectHome initiative today at the Choctaw Nation at Durant, Oklahoma. In a telephone news conference, HUD Secretary Julián Castro said the program is aimed at ensuring that low-income families have access to information, employment and education opportunities that are increasingly online. More than half of those in the lowest income ranges do not have access to broadband, Castro noted. 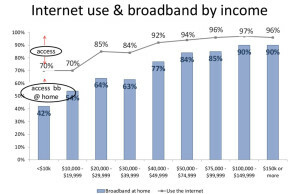 ConnectHome will reach over 275,000 low-income households, including nearly 200,000 children, with support to access the Internet at home. Internet Service Providers, non-profits and the private sector will offer broadband access, technical training, digital literacy programs and devices for residents in assisted housing units. 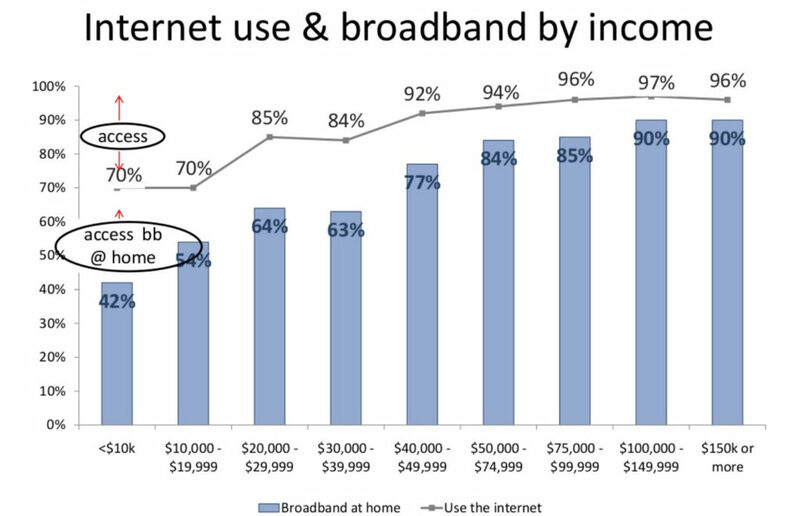 Broadband access by income level courtesy of the Pew Research Foundation. HUD approached SHA officials in the spring to gauge interest in providing free or very low-cost broadband access to residents at one or more public housing developments. The interest is there, and the authority is in the process of gathering the data and finding local partners to participate. The City of Springfield has been named as a partner in the pilot. “We’re very excited about the opportunity to participate in getting SHA residents online at home,” said SHA Executive Director William H. Abrashkin. “Having access to the Internet is key to our our residents being active participants in society and connected to jobs, education and the world in general. If our data shows a tremendous need, and we believe it will, we will determine what we can do to make this happen,” Abrashkin said. Estimates indicate that only about 25 percent of SHA public housing residents have broadband access at home, he said. Data being gathered about where the needs are the greatest will drive the city’s ConnectHome plans, he noted. ConnectHome will unite communities, the private sector, and federal government to expand high speed broadband to more families across the country. HUD will not be providing funding for the pilot, but will rather provide support to make the private-public partnerships happen. HUD will also gather information on how many people gain broadband access as a result of the program, and what the impact of that is, particularly among school-aged children. Some private companies that have agreed to participate in ConnectHome projects around the country are Google, Sprint, Best Buy, Cherokee Communications, the James M. Cox Foundation, and GitHub, among others.